If you are looking for information on the Papa Romano's franchise business opportunity, Papa Romano's franchises or Papa Romano's franchising, then you have come to the right place. We prove that QUALITY speaks for itself. Papa Romano's was founded in 1970 to provide premium quality pizza, subs, salads, chicken, pasta, breads and other Italian prepared foods. 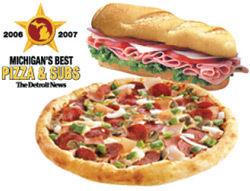 Our award-winning chain has grown to approximately 60 locations in southeast Michigan. Pizza continues to be the #1 dinner choice in America. Our "Catering On Demand" system that we have perfected over 30 years. We're looking for energetic, dedicated people to help us grow as we help you fulfill your dream of a successful career and financial independence. For more than 30 years, people of all ages have responded with delight when they see our cheerful concentric circle logo with the little Bambino in the center. It has a warm, positive, happy image that draws customers into our stores. You'll get access to the highest quality products, as well as the great recipes that makes Papa Romano's the best.